The Antietam Battlefield Guides is a group of devoted students of the history of the Maryland Campaign who provide historical interpretive services to the public. Successful guides demonstrate a comprehensive understanding of Maryland Campaign history and possess the outstanding interpersonal and communication skills needed to guide members of the public around the battlefield. All guides successfully pass a detailed written examination and an evaluation of their interpersonal and communicative skills before joining the program. The latest member to join the ranks of this esteem group of historians is our very own Innkeeper! Born and raised in Benton, Pennsylvania, a small farming community much like Sharpsburg, Chris enlisted and began his adventure in the U.S. Army in 1984. His 24-year career was spent in and around light infantry units like the 10th Mountain Division, the 25th Infantry Division, and the 101st Airborne Division including combat operations during the first Gulf War (Desert Storm) and Kosovo. During his career as a senior non-commissioned officer, he held a variety of leadership and staff positions at all levels. 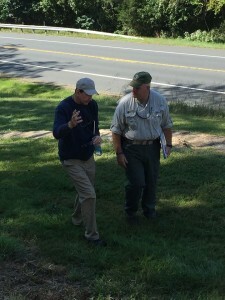 Being mentored by fellow Antietam Guide, Bill Sagle in the West Woods. Chris holds an undergraduate history degree from Excelsior College and a Master’s Degree in Military History from the American Military University. Upon his military retirement Chris continued to serve as a defense contractor for both the Army and the Navy. 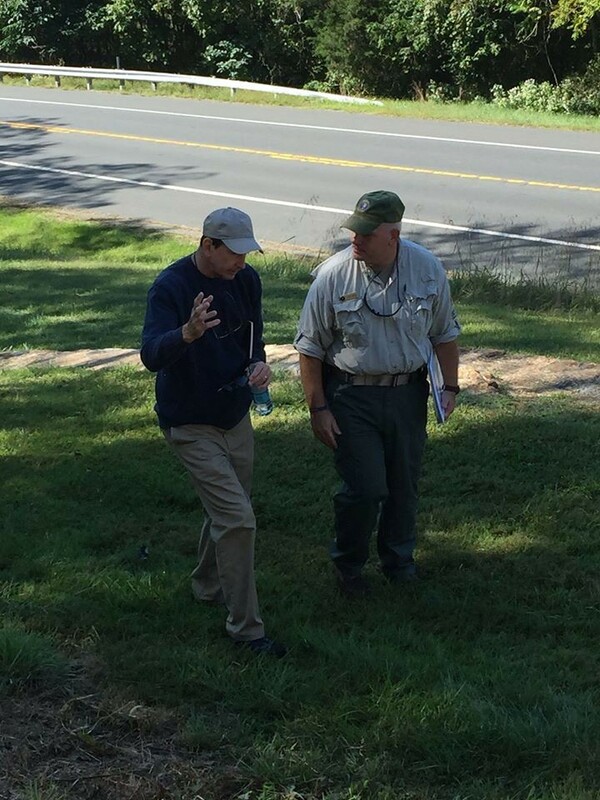 After moving to Maryland he started to volunteer with the National Park Service at the Antietam National Battlefield as a Battlefield Ambassador throughout the park. Chris was recently recognized as a member of the Volunteer Master Ranger Corps. 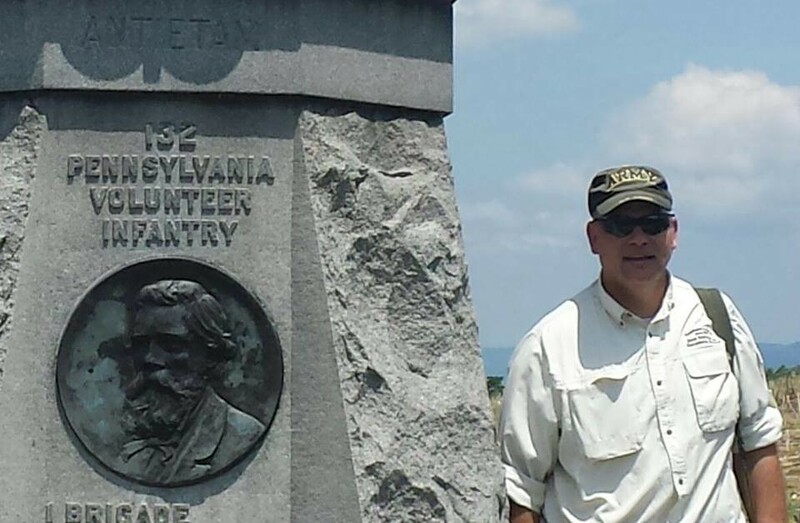 Over the years he has led military staff rides and guided scout groups on hikes across Shiloh, Chickamauga, Manassas, Gettysburg and Antietam. After successful passing the written exam in the spring of 2014, Chris’s preparation and practice for the final evaluation was put on a temporary hold while we were pursuing the purchase of the Jacob Rohrbach Inn, Bed & Breakfast. Chris’s interest in the American Civil War and the Battle of Antietam in particular occurred many years ago when he was told the story of a young man named Henry. In August of 1862, Henry, who was from Montour County, Pennsylvania answered President Abraham Lincoln’s call for 300,000 nine-month militia. Henry enlisted in the ‘Danville Fencibles’ which was comprised of men mostly from the Danville Iron Works. Before the end of the month they were mustered into service as Company A, 132nd Pennsylvania Volunteer Infantry Regiment and in defensive works outside Washington. With General Robert E. Lee’s Confederate invasion into Maryland, they were quickly assigned to Brigadier General Nathan Kimball’s First Brigade, 3rd Division, Second Army Corps, alongside three veteran regiments. In just over a week’s time Henry and the 132nd Pennsylvania would receive their ‘baptism of fire’ fighting for a Sunken Road among the fields and farmsteads that reminded them so much of home. 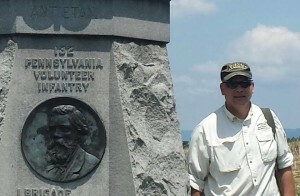 Antietam Battlefield Guide, Chris standing next to the 132nd Pennsylvania Volunteer Infantry monument along Bloody Lane where his great-great grandfather fought. Henry survived the battle at Antietam as well as the battles of Fredericksburg and Chancellorsville unscathed. After being mustered out he returned home to Danville to become a successful businessman, farmer, and family man. This story was passed down to Chris through the generations, as Henry Vincent was his great-great-grandfather. Come join Chris at the Antietam National Battlefield to walk the Sunken Road and the pristine countryside to hear the stories of other men like Henry Vincent and understand their experience during the bloodiest day in American history. If you would like to schedule a battlefield tour with Chris or one of our other outstanding Antietam Battlefield Guides you can call the Inn or you can call the museum store located at the Antietam National Battlefield Visitor’s Center, at 301-432-4329.